First, choose a site that offers full sun where you will mark out a circle to be the “pizza”. Most pizza plants are sun-lovers and need 6-8 hours of sunlight. No matter how large your garden space, make sure to loosen your soil and amend it with well-rotted manure or compost and a balanced organic fertilizer. To create the pizza, tie a string to a stick; for a 6′-wide pizza garden, cut a string so that it’s 3′ long. (For an 8′-wide pizza garden, cut a string so that it’s 4′ long.) Attach the string to a stake in the ground where the middle of the pizza will be. Keeping the string tight, walk around in a circle and mark the ground to show the garden’s border. No matter how large your garden space, make sure to loosen your soil to at least a foot in depth, and amend it with well-rotted manure or compost, and a balanced organic fertilizer. The edge of the pizza garden can be marked with rocks placed around the perimeter, and the pizza garden can be divided into “slices” by the addition of more rocks or markers. Divide the circle into six equal wedges. To make it even more interesting, use your imagination to plant something that looks like cheese and pepperoni. For example, round terracotta saucers can be used to look like pepperoni or straw can be scattered as mulch to look like shredded mozzarella. 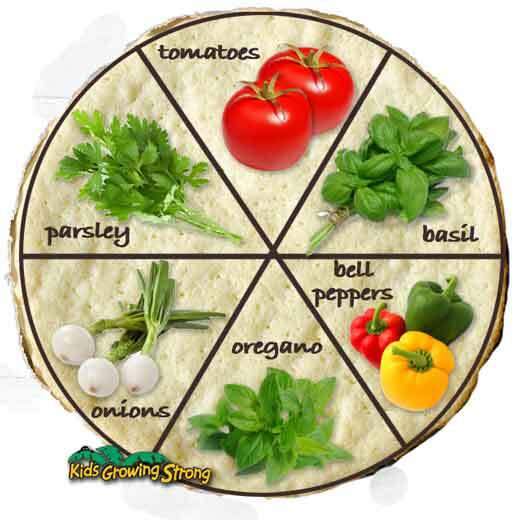 It is easiest if you grow three vegetables and three herbs in your pizza garden. You can plant seeds following instructions on the seed packets or set in plants that are already started. Be sure to give them space. In one wedge plant 2 or 3 oregano plants. Oregano is a perennial herb that gives pizza the characteristic taste and wonderful smell. Each oregano plant needs 10 to 12 inches of space. Basil is an annual herb. Plant 2 to 3 plants in its wedge. There are several varieties of basil. Sweet basil is a good choice for a pizza garden. Basil likes to be spaced 15 to 18 inches apart. Onions can be planted from seeds or sets. Select red, white or yellow for your garden. You can plant up to 30 onion sets in one wedge keeping them 4-5 inches apart. Plant 1 or 2 pepper plants in your garden. Green bell peppers are the most common, but you can plant any color sweet, bell type of pepper. The also come in yellow, orange and red. If you like hot, spicy pizza, you can grow a hot variety of pepper. Space bell peppers 12 to 15 inches apart. The last wedge of the pizza garden should be planted with one tomato plant. A paste tomato variety, such as Roma, is recommended. Roma has small, oblong tomatoes with a thick meaty flesh. San Marzano is another good choice for a pizza garden. Tomatoes need at least 2 feet of space; larger varieties need 2-1/2 feet. It’s very easy to make your own sauce by sautéing freshly peeled tomatoes, seeded and mashed with fresh oregano, garlic and a little olive oil. Tomatoes need more water than the other plants. Next in need of water are the basil and peppers; Onions need the least water.